Crown group Passeriformes are osteologically fairly uniform birds and include more than half of all extant avian species. Molecular analyses provide a phyloge-netic framework for the major clades, and according to these studies the Acanthisittidae (New Zealand wrens) are the sister taxon of all other extant passerines, the Eupasseres, which comprise the Suboscines and Oscines (Ericson et al. 2003; Barker et al. 2004). The Suboscines (tyrant flycatchers, antbirds, manakins, and allies) are mainly restricted to the New World, their sole Old World representatives being pittas (Pittidae), and broadbills and asities (Eurylaimidae). Phylogenies derived from molecular data indicate that the globally distributed Oscines, the most speciose passeriform group, originated on the Australian continental plate (Barker et al. 2002; Ericson et al. 2002). Passeriform birds have an abundant Neogene fossil record, but only a few early Paleogene fossils have been identified. Two fragmentary bones, a proximal car-pometacarpus and a distal tibiotarsus, from the early Eocene Tingamarra Local Fauna of Australia were assigned to the Passeriformes by Boles (1995, 1997c). As in extant passerines, the carpometacarpus exhibits a large intermetacarpal process. It differs, however, from that of modern passerines in the proportionally larger ventral portion of the carpal trochlea, and the fact that the depression between the major metacarpal and the pisiform process is shallower. Additional material is certainly needed for an unambiguous identification of these fossils, but from a biogeographic point of view it is well possible that they belong to stem group representatives of the Passeriformes (see below and Sect. 17.2.1). All other Paleogene remains of passerines are from the Oligocene of Europe. The earliest fossils come from the early Oligocene of Germany and France, and the scarce record indicates that by this time Passeriformes were not yet the numerically dominant group among the small arboreal birds (Mayr 2005a). 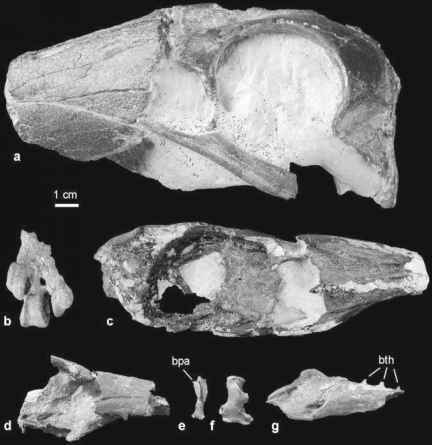 From the early Oligocene of Wiesloch-Frauenweiler in Germany, Mayr and Manegold (2004, 2006a) described a skeleton of a small passerine as Wieslochia weissi. This species lacks derived characteristics of crown group Oscines, such as a bifurcated acromion of the scapula, and shares with extant Suboscines the presence of a well-developed tubercle on the ulna for the ventral collateral ligament (tuberculum ligamenti collateralis ventralis). Wieslochia also resembles extant Suboscines in overall morphology, but some features may support its position outside crown group Eupasseres: the minor metacarpal of the carpomet-acarpus does not protrude as far distally as the articulation facet for the minor wing digit, the coracoid lacks a hooked acrocoracoid process, and the hypotarsus exhibits furrows instead of canals for the medial of the most plantar flexor tendons (Mayr and Manegold 2006a). A wing fragment of a very small passeriform bird was reported from the early Oligocene of the Luberon area in France (Mayr and Manegold 2006b). The well-preserved carpometacarpus of this specimen likewise most closely resembles that of extant Suboscines. The species to which it belonged was of a size similar to that of the Madagascan sunbird-asities (Neodrepanis spp. ), the smallest extant Old World representatives of the Suboscines. Also from the Luberon area, an as yet undescribed complete skeleton of a passeriform bird exists in a private collection in France (Roux 2002; own observation). Passeriform birds were further identified in late Oligocene sites of France (Mourer-Chauvire et al. 1989) and Germany (Manegold 2008). Some of the French specimens were assigned to the Oscines (Mourer-Chauvire et al. 1989), but Mourer-Chauvire (2006) also noted the presence of a suboscine passerine in the late Oligocene (MP 26) of France. Manegold (2008) described a diverse assemblage of small passerines from the late Oligocene of Germany, in which he likewise identified representatives of both Oscines and Suboscines. It is noteworthy that all of these specimens belong to small species. The fact that the earliest European Passeriformes already closely resemble their modern counterparts supports the hypothesis that passeriform birds dispersed on the Northern Hemisphere from one of the southern continents (Olson 1989; Ericson et al. 2003). All known early Oligocene passerines further do not belong to the Oscines, the only passeriform taxon which occurs in Europe today. The earliest European fossil record of oscine passerines is from the late Oligocene (Mourer-Chauvire et al. 1989; Manegold 2008), and nonoscine passerines thus seem to have colonized Europe before the arrival of the Oscines from the Australian continental plate.